Back to school fever is here. As a past educator and current mother I have many philosophies about education, but one BIG one is that we need to show Arizona kids that we value education. For me this starts at home. Each year before school starts we have a few traditions to show our children just how much we value the ability to be educated and how great the learning process can be. Think of how awesomer (I'm allowed to use made up words - even when talking about education) Arizona kids would be if we can get them to love learning more. Life long learners - yes please!! Now, some of your kiddos have already started school and some of you may already feel stressed with your to-do list. Don't fret. These are simple traditions that can be easily incorporated into your family before or after school starts. I'll let you in on a secret: I'm kind of lazy. So, as a mom, I have a few standards that I hold a potential activity up to. "Can I do something in 5 minutes that creates awesomeness?" And, "Is this so easy a lazy mom could do it?" Hopefully the following traditions stick to my standards. We start each school year with a theme. Some years were winners, some years (like last year) I don't even remember because they just weren't catchy enough. First year of this tradition our theme was "SHINE." Each morning I simply reminded my girls to "shine" as they headed out the door to school. They loved it and it started the day on a positive note. They still remember it. This year our theme is "Light the Fire Within." I thought it sounded perfect for what I wanted to capture. I want my girls to learn that they are great girls, that they have a lot of great potential, but that it takes work to unlock their potential and develop their talents. Plus they have been begging to have some fires in our backyard when the weather cools down so if I did a theme with fire I could use an activity we already plan to do to reinforce our theme throughout the year. (See - I love finding the easy way out.) When we have our backyard fires I'll simply remind them of our theme and ask, "What are you doing to light the fire within?" Then they will report on their good deeds and progress. Sappy - most definitely, but, it works! Kids soak this kind of stuff up. On February 17, 2002, nervous anticipation filled the Salt Lake Ice Center for Apolo Ono’s first Olympic short-track, speed-skating final, the 1,000 meters. Apolo was heralded as an Olympian who had a chance to win four gold medals. He typically waits until late in the race to make his move, and this race was no different. With two laps remaining, he finally moved to the front of the pack of five skaters. On the very last corner, Apolo and Li Jiajun from China bumped lightly, then Li bumped Ahn Hyun-soo from Korea, and in an instant they found themselves spilled across the ice, sliding into the padded walls. Only the Australian, Steven Bradbury, remained upright to cross the finish line, the first Australian ever to win a gold medal in the Winter Olympics. As he would later say, his strategy worked perfectly—he hoped the others would crash. As Steven was crossing the finish line, the crowd breathed a collective groan, their hopes of an American gold medal fallen with Apolo, who was also injured in the crash with a gash that would require six stitches. Largely unnoticed in the instantaneous aftermath of the fallen skaters, Apolo scrambled to get up and slide, skate first, across the finish line. He knew that winning the silver medal was still possible and that what would determine his order of finish would be when his skate crossed the line. He barely edged out the Canadian for the silver medal. During the medal ceremony Apolo exuded how thrilled he was. He didn't lose the gold. He won the silver. When Apolo fell, he not only got up, he got up quickly. We discussed how school and learning is not always easy but that you can't let set backs keep you down. Light the fire within and keep working hard. Each year we have a "fancy" dinner where I introduce my little sappy theme to my girls. Some people go all out on cute decor for fancy family dinners. In our house, just add candles, a table cloth, a few bottles of Martinelli's Sparkling Apple Cider, and a mom who talks up what a special night it is and my girls think we are fancy town. This year Firehouse Subs contacted us about a water campaign they are having on Saturday, so I took the easy notch up one and we went to Firehouse Subs for our theme dinner. Get it - FIRE - to go with our theme. Seriously, mothers. Make motherhood easier on yourself. Go ahead and steal this idea too. 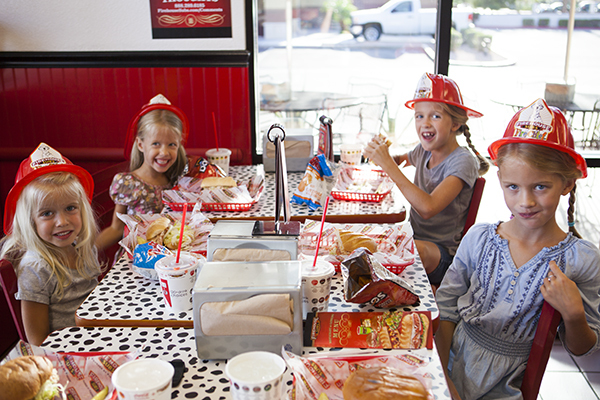 Theme, story, Firehouse Subs. You'll be golden. 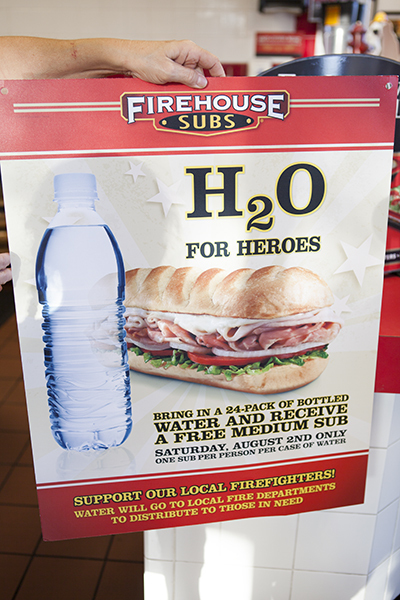 ***This Saturday, August 2nd, 2014 Firehouse Subs is having a water drive. Bring in a 24 pack of bottled water and get a free sub. Sweet deal if you ask me. Plus, you get to help our local fire department help our community. Another win win. More tradition talk after the jump. 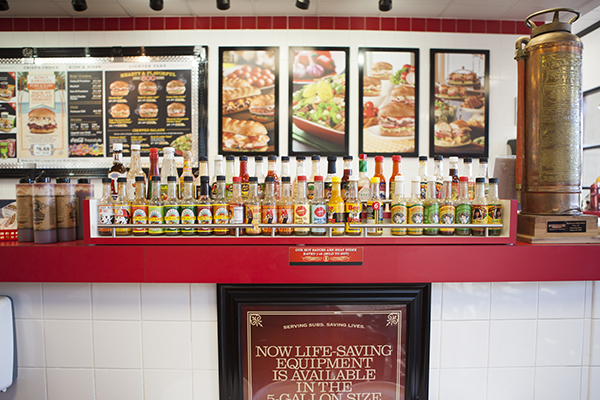 I did take pictures of our trip to Firehouse Subs. We visit the one in Dana Park (Val Vista and Baseline in Mesa) and we love the owners Linda and Jon. They are former educators (Linda taught Kindergarten for 21 years!) and are the sweetest couple. 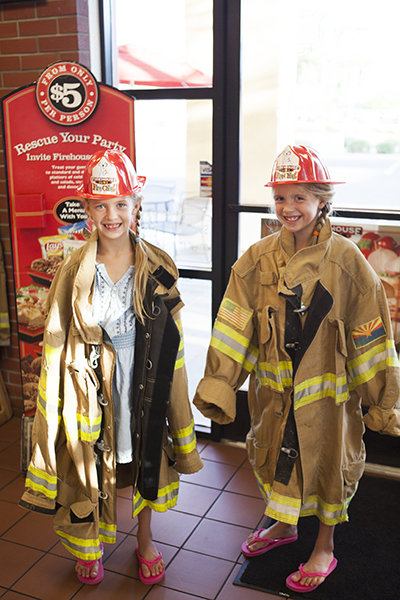 They let my kids dress up as firefighters, gave them fireman hats and showed them a picture book of some of the charitable work that Firehouse Subs does for our local law enforcement and fire crews. Of course I connected that back to our theme and talked about serving and helping others is part of lighting the fire within. This smile is a big deal considering we had just gotten done with my least favorite back to school chore: shopping. I think it was the yummy King's Hawaiian sandwich and four happy girls that did the trick. One tip: when you find a restaurant you love, ask if they have their sauces for sale. In the past we've done this at our favorite Japanese restaurant and then yesterday we came home with Captain Sorensen's Datil Pepper Hot Sauce from Firehouse Subs. Delish. This is the hot sauce bar. You can ask to purchase these too. And you can ask for their super super spicy sauces that are just too hot to leave out for the general public. 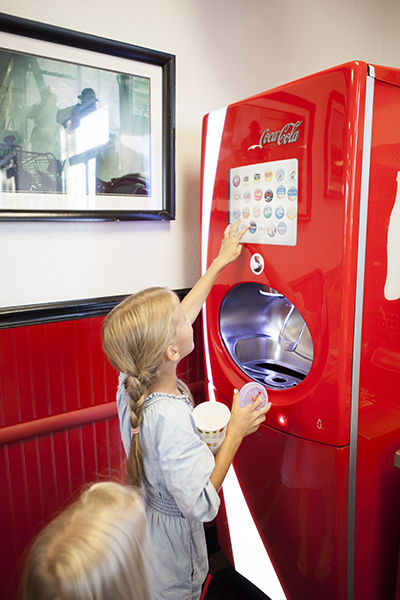 The pop (I'm not a soda gal) machine is definitely mind blowing to little ones. My girls sampled and sampled and sampled some more. Who are your favorite friends? What is something that is hard for you to do? What is something that is easy for you? What is the best part about being (insert age here)? What are you most excited about for (insert grade level in school here)? What back to school traditions do you have? And is it pop or soda to you? *Disclosure - as always, all opinions are mine.